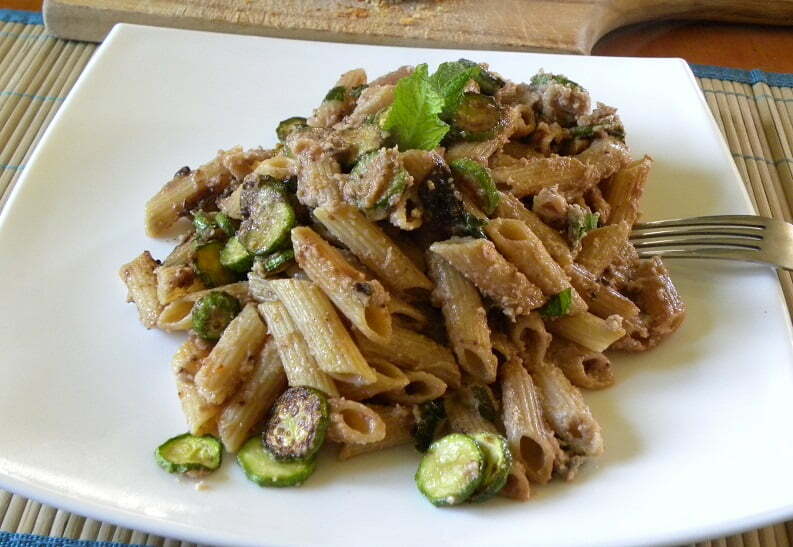 Penne Skordalia is an easy and healthy pasta dish made with Walnut Skordalia, a Greek diip made with olive oil, garlic, bread and walnuts. It is one of those recipes where it will leave you wondering “why didn’t I think of this before?”. It’s easy to make and a good way to use your leftover Skordalia with Walnuts. During the fasting period of Lent, I get very creative when creating new recipes. This recipe may be very simple but then many other simple recipes are delicious but it always needs someone to think about it first. When I had some leftover skordalia (garlic dip) from the 25th of March, I thought that the traditional Italian recipe of aglio (garlic) e olio (olive oil) are ingredients already included in skordalia, so why not combine it with pasta? I do not recommend that you try this recipe with the traditional skordalia with potatoes but make the one with bread and walnuts. The bread has the texture of grated cheese and the walnuts add a wonderful taste and crunch, plus it makes the dish very healthy. Apart from adding salt when boiling the pasta, I did not add any additional salt when preparing the dish, as there is salt in skordalia and the olives are brined. I used whole wheat pasta which I combined with courgettes, Greek throumbes olives and fresh mint, which pair well with the other ingredients. We loved it so much that in the future I will be making more skordalia, just to use it in this dish. Heat water in a large pot, add salt and cook pasta according to package instructions, about 15 minutes. Meantime heat the olive oil in a non stick frying pan and saute the courgettes on both sides. Add the olives and saute for a few minutes and add the pasta and mix. Finally add the skordalia and fresh mint and mix. If necessary add a little pasta water and mix . Mouthwatering! My kind of pasta dish. Simple yet very tasty, Ivy. I love the combination of flavours.